The look of your TV is, of course, a leading factor when you’re kitting your entertainment area out, but the sound is actually most important. You’re simply not going to get joy out of your experience if the sound is weak. Boosting the sound doesn’t mean that you have to buy a new house because the sound upgrade you’re getting is that big. Soundbars are the way to go and they love smaller spaces – and look great too. Polk soundbars solve a world of audio dilemmas to let you have powerful, room-filling, high-performance surround sound quicker than you can flick the channel. Whether you want immersive surround sound, whole-home audio, affordable home theatre, ultra-compact, maximum performance, or premium home theatre, Polk soundbars are the business. The wide range of Polk soundbars does away with the need for a full-audio component system and lets you stream all your favourite music, movies, and more, wirelessly from your smartphone, tablet, or other compatible devices. Experience crisp sound clarity with patent-pending VoiceAdjust technology. 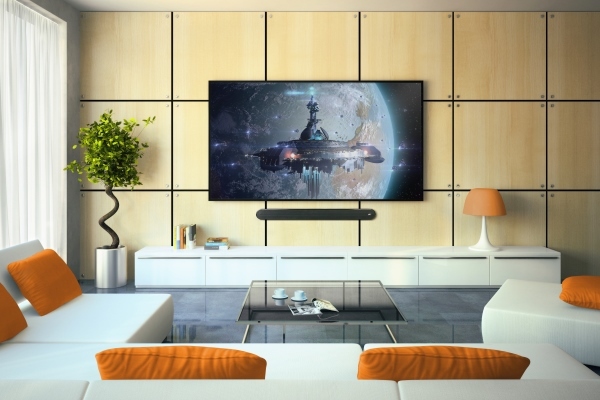 Found in all Polk soundbars, this advancement uses adjustable three-element line arrays to produce unequalled audio quality, whether you’re right in front of the TV or anywhere else in the room. Of course, you want your audio to put you at the forefront of the action when you’re indulging in your favourite movies. Get the full experience; experience it like you are in the movie, with exclusive full-complement bass drive technology from Polk soundbars. Improved lower midrange, upper bass tonal richness, transient response speed, and overall output capabilities bring your movies to life. As you can tell, Polk soundbars are packed with innovative features. Music and Movie Immersion Modes paired with Dolby Digital 5.1 and 2.0 decoding deliver a thrilling surround-sound listening experience. The MagniFi soundbar, for example, is designed for larger flat panel TVs. It’s a next-gen soundbar with wireless subwoofer, which features VoiceAdjust. Your favourite shows will never be the same again – imagine sports, movies, music, cartoons for the kids, and thrillers for the teens in sound quality that nobody has heard before! You’ll have flawless blending between mid-range and low frequencies thanks to the built-in critically tuned ports in Polk soundbars. Use the bass control to make adjustments and find the perfect subwoofer position. The power of Polk soundbars comes from advanced analyses of a speaker’s entire electroacoustic and mechanical system. What this has done for sound is unbelievable because they’ve used a selection of better materials and more efficient geometry to build better-sounding speakers. What are you waiting for? Get powerful, room-filling, high-performance surround audio into your home today. This entry was posted in Polk. Bookmark the permalink.